If you hear heavy thumping and walking in above your head, over the ceiling, and in the attic space, it's likely a raccoon living up there. Other animals that frequently live in attics include squirrels, rats, and opossums, but the raccoon is the largest and noisiest. If you ever hear any kind of vocal noises: chattering, growling, etc. then you are almost certainly dealing with a raccoon. In fact, in the majority of cases, you are in fact dealing with several raccoons, because the most common reason a raccoon will enter your attic is to build a safe den to have young. That's right, the raccoon is probably female. If she's broken in during the spring time, you can be almost 100% sure that she has a litter of pups. Down here in Orlando, FL raccoons have young year-round. Home remedies, such as ammonia soaked rags or mothballs won't work, go ahead and try them. Pest control products, like ultrasonic sound emitters or coyote urine powders are gimmicks. DO NOT attempt to use poison - inhumane, and you'll end up with a rotting animal in the attic. The animal must be physically removed, by trap or by snare pole, and relocated away. Don't forget that there's probably baby animals in the attic - hand remove them all. In order to keep future animals out, identify and permanently seal the entry locations. This family of raccoons was living in the attic. When I say "family" there is no male raccoon. Very few mammals engage in co-parenting. It's almost always just the mother who raises the litter. Note that the wood is all chewed, the insulation packed down, the paper ripped off. You can see three babies here. The mother can be removed via a snare pole, if a skilled wildlife control professional does the job. It's not easy work. The raccoon is not harmed during the process. After I removed it from the attic, I place it in a holding cage. I then go get the young, put them in a bucket, and reunite them with mother. They are all relocated together, over 20 miles from the capture site. If you are going to relocate wildlife be sure that it is legal in your area, that the animals are healthy, that you do it responsibly, and that you relocate to a suitable habitat, far from any homes. It should also be at least ten miles from the capture site, preferably more, since there's probably other houses within ten miles of your house. Here we see just one of the entry points the raccoon was using to go in and out of the attic. A soffit vent hole near a downspout. Notice the dirty feet marks all over the wall. People are often surprised that raccoons can enter and exit such a seemingly small hole, but they have no problem. If they can get their head through, the rest of the body follows. This is not the type of work that the homeowner could do by his or herself. It has taken years of field experience to learn best wildlife control practices. A true pest control professional will do the job correctly. But not a bug-spraying pest company, a specialized animal control expert. We are actually known as nuisance wildlife control operators, or animal damage controllers. If you have raccoons living in your attic, and you live in the Orlando, FL area, give me a call. I operate a professional wildlife removal and pest animal control business in Orlando Florida. I deal with wild critters and control them via trapping, exclusion, and prevention techniques. If you have raccoons in the attic, or raccoons in the ceiling, and need to know how to get rid of raccoons, give me a call any time and I can professionally take care of your Orlando raccoon problem. 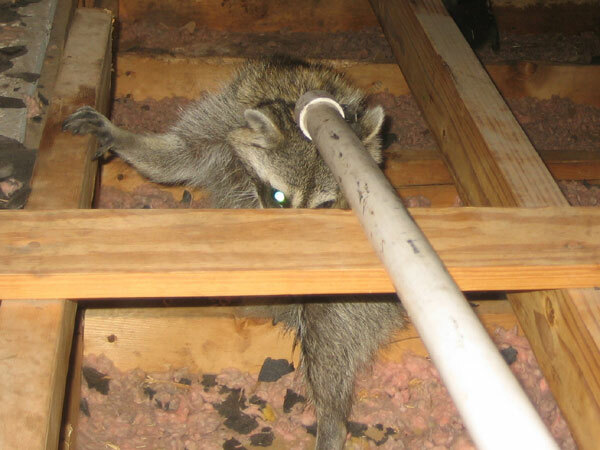 How to capture a raccoon that lives in my attic house - The first mistake many homeowners make when trying to capture a raccoon in the attic of their house is that they try to handle to job on their own. Most states do not let just anyone trap and remove raccoons. Because of the high incidence of rabies in the species, health departments and local governments have cracked down on the public’s interaction with this mammal. Hiring a professional will not only save you time and a headache, it will keep you out of harm’s way. 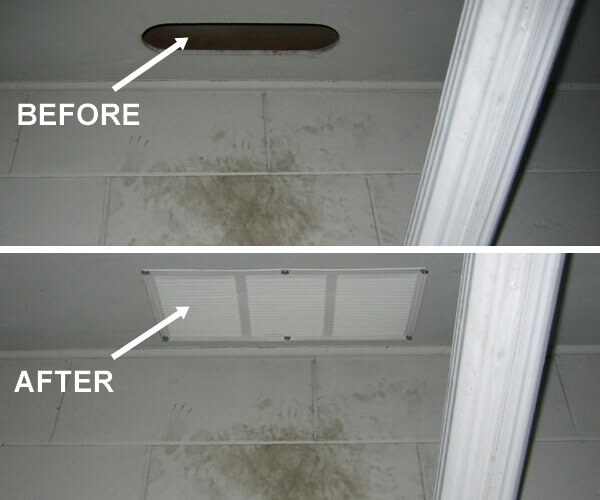 If you’re one of the many who scoff at such safety laws, the next most common mistake illegal trappers make is putting the cage trap inside of the attic. Most raccoons won’t enter a cage inside of the building. Your best bet is to secure the device to the roof of the house, just outside of where the raccoon is entering. If this isn’t possible, place the trap at ground level where the critter begins its climb up the siding to the attic. When baited with bread of marshmallows, cage traps are hard to resist. Just remember that there are probably baby raccoons still inside. Before you relocate the adult, do your best to locate the babies. Failure to do so will result in dead bodies hidden somewhere within your walls. How do you know if you have a raccoon in your attic? Strange noises are the first sign that you may have some uninvited animals in your house. Be aware. Squirrels and raccoons are the most common uninvited wild guests that sneak in the people’s houses. Raccoons are night active animals. If you are hear funny squeaky sound in the ceiling during the night, eliminate squirrels because they are active only during the day. Don’t be afraid and check it personally or just send your husband. When do they inhabit your attic? It could be two periods during the year. 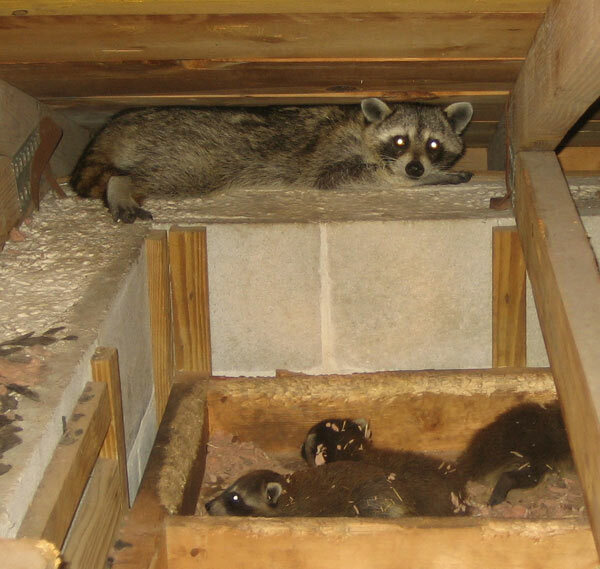 Period between March and October is their birthing season, so if that is the time you hear noises; it is probably that on your attic are mother raccoon with her babies. She was looking for a shelter where she could deliver her babies who will be safe there and protected from the other animals. And also, they know that you have a plenty of different food in your house and she will somehow find it and steal it. That’s why people call raccoons a thief animals. Do not worry about how long it will last. Mother would stay here only for a several weeks; just enough to her babies get older and get more independent. But there are some cases when mother leaves her children too early in search for other home or mate or food. It is very important to allow adult female mother to nurse her little raccoons, so eventually when they grow older, they could follow her out of the house in the nature. If you get rid of the mother, babies could die or get stuck between the walls and you would never find them. Not to mention the stink and noises that would spread through the house. Then, you should demolish the walls to find them. That is the job that you don’t want to do, trust me! Second period is winter because they are looking for a food for their youngsters. You can see the tracks: Raccoons have five toes on both front and hind feet. Their trails looks like a human baby leave a footprint in the sand; only raccoons have longer toes. Tracks are about 7cm long (3 inches). You must ask yourselves now, how do they leave tracks if they don’t leave their babies. Well, they go outside to urinate and defecate. So, they will have muddy feet and leave footprints on your floor. That’s how you can also see as a sign that you have some animal in your house. Also, if you see some scratches of claws or some openings in the wall that weren’t there before, you must react immediately. How to catch a raccoon in your attic - Raccoons are one of the trickier nuisance animals to get out of a home. They are incredibly smart, and they will not usually enter a trap inside the attic itself. 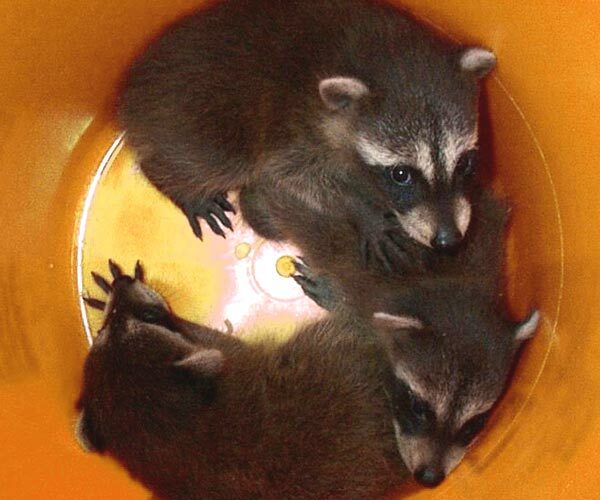 Your best bet is to gather up any baby raccoons that are in the attic. The mother will not be with them all of the time, so it shouldn�t be too difficult to find them and remove them. Any babies can be placed in the cage trap and the trap set outside. Leave the device set so the mother will go in after her offspring. Remember not to leave the babies out for too long or in the heat of the day. The mother raccoon will be active at night, and that is when you want to put out the cage. If you�re no comfortable using the tiny raccoons as a lure, you can bolt the cage trap to the roof of your home, just outside of the hole the raccoon is using. If you�re sure the animal is inside the home, you can try to attach the cage trap to the opening. There are rare instances where babies are not involved, and to solve these situations, the raccoon can be lured into a trap with bread or marshmallows. But be aware: If you�re not licensed to trap, it is probably illegal for you to trap a raccoon in your attic.